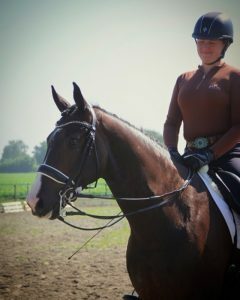 I was in the Netherlands with my friend Belinda Nairn looking at horses for two clients. We’d found what we were looking for for the first, and we had some extra time to kill, so off we went to preview horses for the second client, who was arriving the next day. One was a 7-year-old gelding—younger than I wanted for a kid with NAYC ambitions—but with a kind eye and a business-like manner. The owner rode him first and did a fine job, and while he wasn’t really lighting my hair on fire, he looked quality enough, so I hopped on. And it was like coming home.